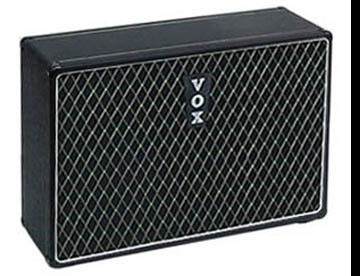 Produced in limited number by Vox during 1966, the 15, 30, 60 and 120 watt Vox UL amplifiers merged a solid state preamplifier section with a tube output stage. The 30 watt UL 730 amplifier was used extensively by the Beatles during the recording of the Revolver and to a lesser degree, the Sgt. Peppers albums. After failing to receive market acceptance, Vox dropped UL Series amplifiers in 1967, replacing them with new all solid state models. North Coast Music offers accurate reproductions of the open backed 715, 730 and 760 UL Series speaker enclosures. The 715 cabinet accommodates two 10 " speakers. The 730 cabinet accepts two 12" speakers. The 760 cabinet was designed for two 12" and two 10" speakers. The North Coast Music reissue Vox UL cabinets are constructed from 3/4" baltic birch plywood and feature half lap joinery, eight 2-pin corners, black basket weave vinyl, black Vox diamond grill cloth, a vertical Vox logo with white letters, a single 1/4" speaker jack with a 20" twin lead wire and original style Rean feet. All speaker mounting hardware is also included. NCM-330 - UL730 Enclosure (no speakers) - 2 x 12" enclosure, open backed, black grill only. ~32" wide, ~21" tall, ~11.75" deep. No speakers included. All North Coast Music reproduction cabinets are hand made by order, no returns or exchanges are possible. Please allow several weeks for shipment from time of order.